Ad-Supported Kindle: Why stop there? How much difference does $25 make? Apparently enough for Amazon to release a separate, ad-supported version of its third-generation, Wi-Fi-only Kindle ( ) for $114 instead of $139 for the standard version. Amazon describes the Kindle with Special Offers, announced on Monday, as the same Kindle, “plus special offers and sponsored screensavers”. 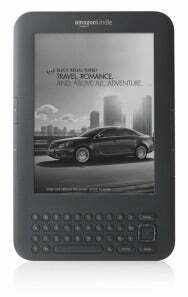 Kindle with a Buick screensaver. Initial deals will lean heavily on Amazon itself, with $10 for a $20 Amazon gift card, $6 for six (Amazon-owned) Audible books, $1 for an album in the Amazon MP3 Store, $10 for $30 of products in the Amazon Denim Shop or Amazon Swim Shop, a free $100 Amazon.com Gift Card when you get an Amazon Rewards Visa Card, and $10 Amazon credit if you buy one of 30 Kindle bestsellers with your Visa card. The only non-Amazon discount is for 50 percent off a Roku player (presumably the $100 Roku XDS ( ), since Amazon says the price is normally $99). The other aspect to the Kindle with Special Offers is sponsored screensavers. Amazon plans to launch with Visa, Olay, Buick, and Chase (with the Amazon.com Reward Visa Card). Amazon is also creating a Kindle app and (soon) Website called AdMash, which will let customers vote on screensaver candidates. Those with the most votes will be the ones delivered to Kindles. In all other ways, this Kindle is the same one Amazon has been selling for $139. The Kindle with Special Offers will be released on May 3, and Amazon is now taking pre-orders for the device.